New quarter honors the first national park area to protect a river system. Representatives of the United States Mint (Mint) and the National Park Service today celebrated the release of the America the Beautiful Quarters® Program Coin honoring Ozark National Scenic Riverways in Missouri. Products containing Ozark National Scenic Riverways quarters are available for purchase directly from the United States Mint’s online catalog (http://www.catalog.usmint.gov). The United States Mint was created by Congress in 1792 and became part of the Department of the Treasury in 1873. It is the Nation's sole manufacturer of legal tender coinage and is responsible for producing circulating coinage for the Nation to conduct its trade and commerce. The Mint also produces numismatic products, including proof, uncirculated, and commemorative coins; Congressional Gold Medals; and silver and gold bullion coins. Its numismatic programs are self-sustaining and operate at no cost to taxpayers. The Mint is celebrating its 225th anniversary in 2017 (#USMint225). Ozark National Scenic Riverways quarter b-roll. 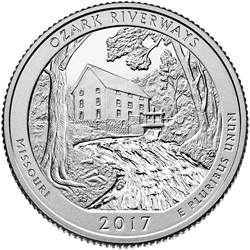 Ozark National Scenic Riverways quarter image. Free lesson plans based on the America the Beautiful Quarters Program. Information about the United States Mint, America the Beautiful Quarters Program, and Ozark National Scenic Riverways.